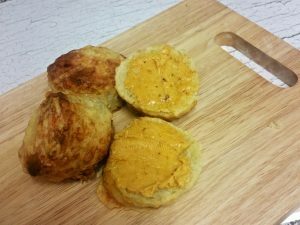 Mature Cheddar Cheese Packed Savoury Scones – Dare to dunk? Well when I planned making these scones it was looking like a chilly September, however it seems here in the UK, the rules are being broken and records set. Anyway what’s wrong with a fresh out the oven fluffy cheese topped scone on a hot day? Add cubed butter lightly combine the dry mix until you get breadcrumbs. Add the grated cheddar along with your mustard and mix well. 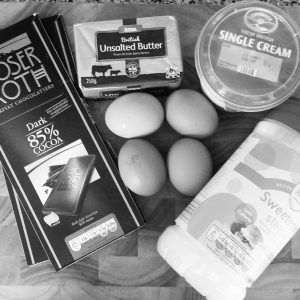 Gradually add the milk to the mixture, and mix to combine, after a while you will have a semi sticky dough. Turn the dough onto a floured surface and gently pat (not roller) to create a fat slab around 2cm thick. The last time pat out to around 2.5/3cm thick. Use a cookie cutter to press out as many scones as possible and place them onto a board/plate. 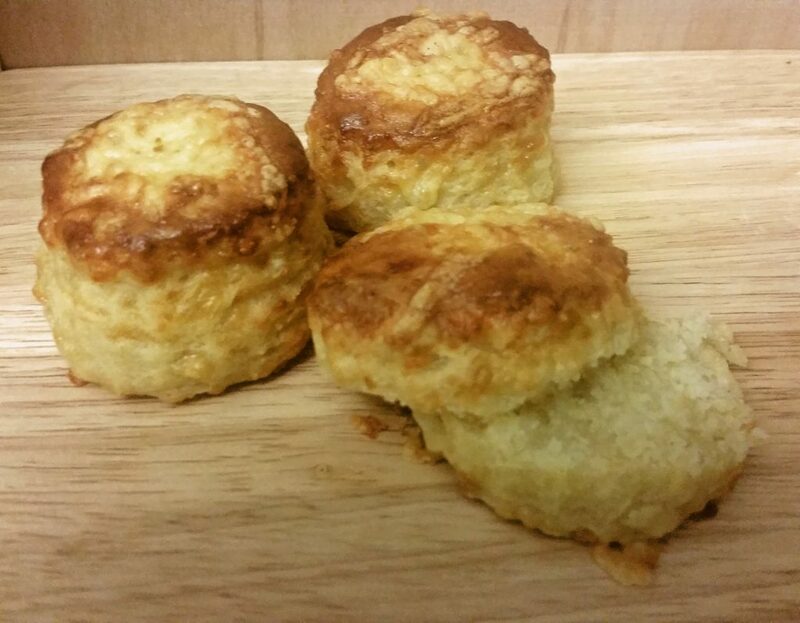 Place the unbaked scones into your fridge for 30 minutes. 15 minutes into chilling, Turn your oven onto 220c and place a baking tray in to preheat. Beat your egg and milk for brushing. Once ready remove your tray from the oven and place your scones onto your hot tray. Brush with egg mixture and sprinkle tops with cheese. Bake at 220c for 15 Minutes or 18 if you prefer a more coloured scone. You could also cheat and just whiz the flour and butter in a food processor. If grating your own cheese again the food processor is your friend. Fresh out the oven I topped mine with some Lurpak® Infusions Smoked Chipotle, they were totally delicious. I think they would be a amazing alternative to serve instead of dumplings on a winter stew. Hosted by Kat at the Baking Explorer and Stuart at Cakeyboi. 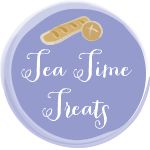 Please checkout these other FAB blogs. Pizza on the bbq. A pizza made at a recent pizza party. Cooked over charcoal on a pizza stone. Pizza on the BBQ, Real thin & crispy pizza on the BBQ? Order your pizza stone at Amazon. Anyway, on my quest to make pizza on the BBQ I came across 2 recipes for the base. One taken from Uuni the guys who make an amazing pizza oven called the Unni 3. The other from a BBQ Facebook group member HERE. 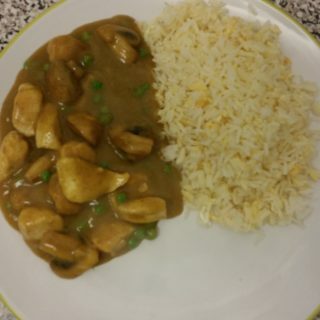 I combined the two to create a simple method and ended up with the following recipe. I’ve made many times and works amazingly time after time. 8 large bases 472 caloires per base – 12 bases 314 calories per base. Add the sugar and yeast to your jug of water, stirring well and leave to stand for 3 minutes. Next, place your flour into a large mixing bowl and mix your salt through to ensure even distribution. Make a small well in the middle of your flour and pour the yeasty water we made in step one into the centre. Using a spoon, mix the flour into the water, it may look like not all the flour will be mixed in but keep combining until mixed. If needed use your hands to get the last bits mixed. Knead your dough on a floured surface until it becomes smooth and elastic. I recommend following the guide on this video, as it teaches you the technique if you have never made a dough before. Next, I weighed the dough to calculate how many grams per base, Just weigh your total dough and divide by 8, for a larger base or 12 for a more manageable size. 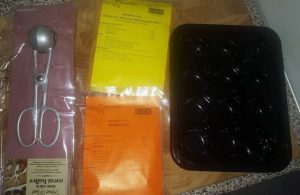 TIP: If you only need a few bases, you can freeze any spare dough balls after step 7, tightly wrapped in clingfilm. Then once defrosted, continue to step 8. Divide the dough into the desired number of bases, shape into balls and then set on a baking tray to double in size again. You’re Done! Lets make a tomato sauce and stretch our bases. For the pizza sauce you will need. Simply put all the ingredients into a hand mixer, blender. and lightly break down the tomato’s so they are spreadable, put it in the fridge till you need it. Update – readers have also used health mixers such as Nutri bullet – Thanks for the tip John! 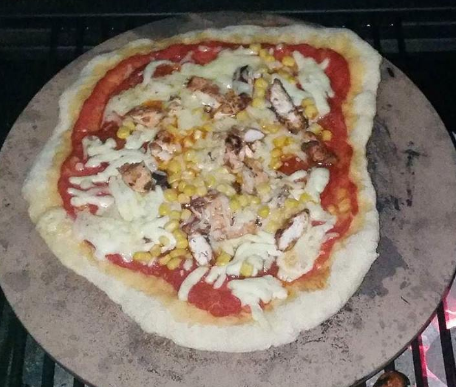 Get the BBQ on, gas or charcoal your looking for around 300-350c, Set the pizza stone / http://amzn.to/2pog97z on the BBQ while it heats up. Mine took around 30 mins to hit the temp using charcoal. Your BBQ must have a lid for this method. Take one ball of dough and stretch it to around 12″ (if 8 bases) . This part for me was tricky but if you have never done it this video sums it up easy (though my pizza was not that round the first time!). Transfer your base onto your means of moving the pizza (pizza peel or greaseproof paper), with a small sprinkling of fine semolina to stop any sticking. Place appox 2 tbsp of the tomato sauce you made and spread it out, leaving a nice edge for a crust to form. Arrange your chosen toppings including you cheese however you like. Remembering cheddar will release it’s oil, so try using grated mozzarella it melts so much better, or some shops now sell a pizza cheese blend. Transfer the pizza on the stone, close your bbq lid and check after 2 minutes, then every 30 seconds. Once cooked to your liking remove, slice & enjoy!Im currently looking for new ideas for toppings, so please comment below with your ideas!There you have it pizza on the bbq, a change from the usual burgers and they are great for a small social event as everyone can top their own pizza, making it more fun. Burgers and Skewers made using products from Tongmaster Seasonings.